Using our exhibits, this Adventure Tour examines the tools, designs and advances made in science and technology and their influence on history within the region. Discuss how the geographical characteristics of the area have provided a unique set of challenges and opportunities for technological innovations. 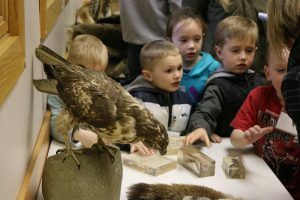 Investigate the life history of animals, including otters, porcupines and birds of prey, and learn how different species adapt to various High Desert environments. Have you ever wanted to work with wildlife or explore a career in wildlife biology? This special behind-the-scenes tour provides an inside look at how we care for animals and why they are here at the Museum. Cost: $7 per student, 20 student maximum per tour. Price includes admission to the Museum. Concurrent tours may be available.